Summary: Mary Engelbreit's Fan Fare Cookbook collects 120 delicious recipes submitted by some of her most devoted fans and brings them to you all wrapped up in Mary's delightful original artwork. Prior to being included in Mary Engelbreit's Fan Fare Cookbook, these scrumptious recipes from Mary's fans underwent extensive testing and resulted in resounding approval by their families! Rest assured that these recipes offer easy, mouth-watering dishes for any occasion, including appetizers, breakfast foods, breads, soups, salads, side dishes, entrées, and desserts. When I first picked up MARY ENGELBREIT'S FAN FARE COOKBOOK: 120 FAMILY FAVORITE RECIPES, I wasn't exactly sure that it would appeal to me. While I think Mary Engelbreit illustrations are cute, I was afraid that this book would be filled with recipes that I would never make. Wow - was I ever wrong! I was pleasantly surprised by how many recipes I marked to try, and I think this cookbook will quickly become one of my favorites! Once I read the premise behind this cookbook, I realized that it is exactly the type of cookbook I enjoy. It's chock full of recipes from friends and fans of Mary Engelbreit, and usually individuals only submit their "best" recipes to cookbooks like this one. I found that there was a wide range of recipes from appetizers and beverages, to breakfasts and breads, to soups and stews, to salads and sides, to main dishes, and finally to desserts. I recognized many classic recipes as well as some very original new ones. Ms. Engelbreit admits up front that she is not what you would call a cook. And that's why she asked her fans and friends for recipes. She does say that she appreciates good food though (who doesn't?) and these recipes were each tested in her studio. What I love is that these recipes are easy enough for those of us who don't have the time to cook or the desire! As I mentioned earlier, there are dozens of recipes that I want to try, but I decided to first try the Pull-Apart Caramel Buns. I have seen recipes similar to this one, but I decided to make them for myself since the recipe was so easy. You start with thawed, frozen bread dough and you add butterscotch pudding and a caramel mixture that you make over the stove. I made these rolls up the night before and put them in the refrigerator. Then, I threw them in the oven first thing the next morning. The recipe couldn't have been easier or more delicious. My only problem was that it made a lot of cinnamon rolls (a 9x13" pan) and I didn't want to eat all of them! I think it's an ideal make-ahead recipe, and I can't wait to make it the next time we have overnight guests. There are also quite a few main dishes that I want to try including Peppy Pasta (see below), the Hot Chicken Pasta Salad, the Sun-Dried Tomato & Chicken Pasta, the Penne with Artichoke Hearts, Sun-Dried Tomatoes & Herbs, and especially the Chicken Limon! Some of the recipes aren't exactly low-fat, but quite a few definitely lean towards fresh and healthy side! Cook the pasta according to the package directions, drain, and set aside. Meanwhile, in a large serving bowl, combine the tomato, pepperoni, Parmesan cheese, olives, oil, salt, garlic powder, mushrooms, and artichoke hearts. Add the cooked pasta to the tomato mixture and toss to coat. Of course the cookbook has loads of adorable Mary Engelbreit illustrations throughout as well as little personal tidbits from the authors of the recipes. 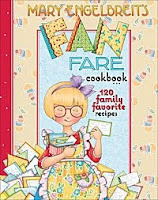 MARY ENGELBREIT'S FAN FARE COOKBOOK is an extremely nice (and useful) cookbook that would also make the perfect gift! Engelbreit's illustrations are usually quite charming, so I'd be attracted to the cookbook for that reason alone. The recipes sound great. One can't eat lean and mean every day! That sounds like a fantastic cookbook! The Sun-Dried Tomato and Chicken Pasta sounds like a recipe we would love! My problem with the Pull-Apart Caramel Buns is that I would want to eat all of them! I've always thought her illustrations were cute, but have never been a big fan. Still, the recipes sound really good. I'm off to see if my library has it! This looks delightful. Daisy daughter has an obsession with cookbooks -- I think we may have a a 2 for 1 with this book! I had no idea she had a cookbook. Peppy pasta sounds really good! 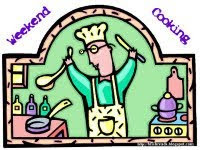 hmmm...see I am not a big fan of Mary Engelbreit's illustration, but I must say the cookbook sounds cute. Anything "family friendly" appeals to me because it will probably be simple and tasty. Better than my weekend cooking project. I am a huge fan of her books. I love the illustrations. I do like her illustrations (especially on greeting cards!). Will check the library for this cookbook!